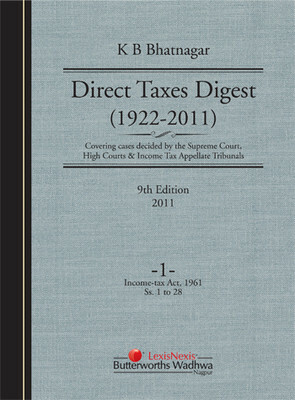 K B Bhatnagar Direct Taxes Digest (1922-2011) in 5 volumes presents an exhaustive collection of judicial decisions relating to the Income Tax Act, 1961, Wealth Tax Act, 1957, Expenditure Tax Act, 1987, and Interest Tax Act, 1974. It is the only digest of its kind to cover judgments delivered by the Supreme Court, various High Courts and Tribunals over a span of nearly nine decades. First published in 1962 by Dr K B Bhatnagar, the Direct Taxes Digest now in its ninth edition, has established itself as the most reliable and authoritative work on direct taxes. The content is arranged section-wise, with topical sub-headings and extensive caselaw coverage and treatment under each provision. This latest updated edition promises to be more comprehensive than ever with over 53,000 judgments including 20,000 new pronouncements.